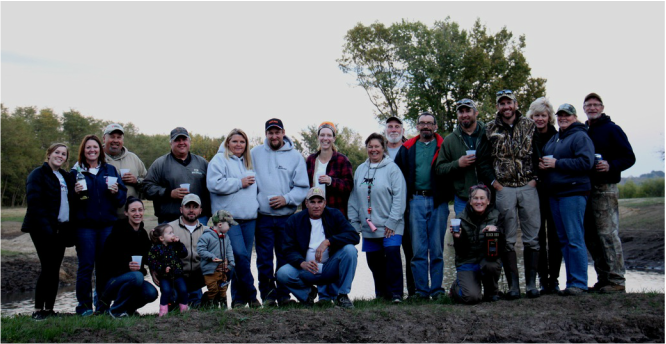 Some KCHRC members at our Tech Pond Pig Roast. The Kansas City Hunting Retriever Club, Inc. was formed in 2006 by hunters who were interested in training their dogs for actual hunting situations. Our primary goal is to pool our knowledge and resources in order to enhance the natural abilities of our beloved retrievers, and help them reach their fullest potential as conservation tools in the field. We are a family-oriented organization and we encourage our members and their families to share and participate together in our club activities. We are affiliated with the Hunting Retriever Club, Inc. (HRC) of the United Kennel Club, Inc. (UKC). The HRC is an organization, "Conceived by hunters for hunters"and is the most exciting thing to ever happen for the bird, the hunter and their retrievers.